Salt, sleet, snow, and slush. They all take a toll on our favourite shoes and boots each winter, and if you are a Winter Warrior like myself, you want to find a way to keep those soles clean and protected. So how is a lady supposed to keep her leather kicks in top-notch winter-ready condition without breaking the bank? Simple. You DIY sole sistahs! Here’s the thing, because leather is made of porous material, these pores and crevices can easily get clogged with dirt and bacteria. Just like our skin, we need to clean these pores of the dirt and bacteria, otherwise we risk the chance of them cracking, tearing, the colour fading, and looking too worn before their time. And since leather is more delicate than we think, it requires a little TLC every 4-6 weeks in order to keep it looking new and not too worn. Being that I love me a good DIY trick, I figured I would help my fellow sole sistahs with a quick and easy DIY leather cleaner that will keep your leather shoes and boots looking their very best, straight into spring 2013! Luckily, the process is incredibly easy and affordable, making this trick hard to ignore. Thanks to the cleansing and acidic properties of Vinegar, by rubbing your shoes with it you are helping to cleanse away any dirt trapped in the material. On the other hand, the Olive Oil works to condition your leather after cleansing away the dirt, ensuring it is protected against future cracks and tears. Two ingredients ladies. Two! That’s all you need to ensure your leather shoes and boots are clean and protected against anything Mother Nature might throw at us this winter. Just make sure you stay consistent in your cleansing and conditioning routine and you will notice your leather kicks stay looking their very best throughout the upcoming snowy season. Jill is a shoe blogger who blogs about, what else, shoes! From reviews on styles such as the Burberry Check Rain Boots, to handy DIY tips and tricks that helps her reader look their very best for less, she covers it all! How much do you love shoes? Enough to wear a diamond crusted necklace in the shape of one? 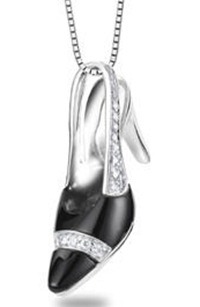 This cute little pendant includes 18 karat white gold and diamonds, and will set you back $1, 335. 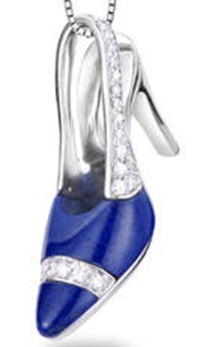 It is too pricey for me, but it definitely would be a great gift for a luxury shoe lover! Here it is in Blue as well.